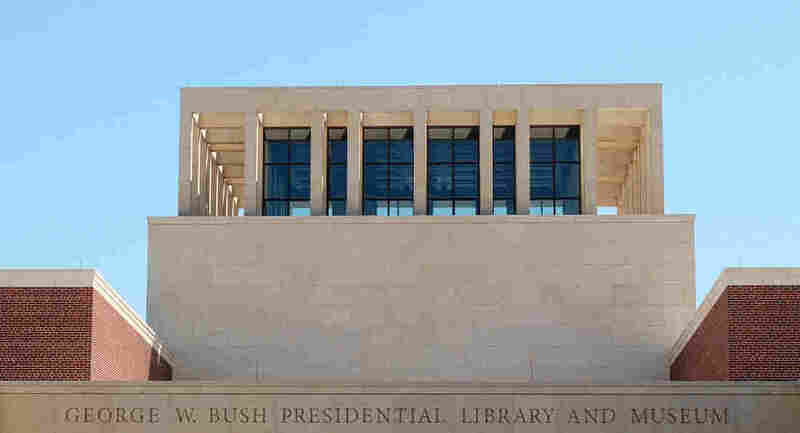 Book News: Bush Library Exhibit Puts You In President's Shoes : The Two-Way Also: Bret Easton Ellis was asked not to attend GLAAD awards; authors who used amphetamines to write; and Isabel Allende's magical realism critiqued. The George W. Bush Presidential Library and Museum officially opens this week in Dallas, Texas. The George W. Bush Presidential Library and Museum, which will be officially dedicated Thursday at Southern Methodist University in Dallas, features an exhibit intended to mimic the hard decisions the former president made during his eight-year tenure. The New York Times reports that "visitors to an interactive theater will be presented with the stark choices that confronted the nation's 43rd president: invade Iraq or leave Saddam Hussein in power? Deploy federal troops after Hurricane Katrina or rely on local forces? Bail out Wall Street or let the banks fail?" American Psycho author Bret Easton Ellis was asked not to come to the GLAAD media awards over the weekend because of his controversial remarks about gays, such as his remark in 2011 that watching the television show Glee was like stepping "into a puddle of HIV." On Monday night, he (characteristically) took to Twitter, tweeting, "Thanks to all members of the LGBT community for your support. Not all of us are neutered politically correct snowflakes. Diversity=Strength." Maggie Shipstead deconstructs Isabel Allende's latest novel, Maya's Notebook, for The New Republic, calling it "a book so unconvincing as to raise questions about how many literary sins have been disguised by Allende's historical settings and shielded by the vague label of magical realism." Brain Pickings editor Maria Popova posts a photo of Vladimir Nabokov's immigration ID — "color of eyes: grey" and "nationality: without." Tuesday night is World Book Night, a nationwide event at which some half a million books are given away free to "light and non-readers" as a way of promoting literacy. In Slate, Mason Currey reports on W.H. Auden, Jean-Paul Sartre, Ayn Rand and other authors who relied on amphetamines to work. Curry writes that Sartre "turned to Corydrane, a mix of amphetamine and aspirin then fashionable among Parisian students, intellectuals, and artists. The prescribed dose was one or two tablets in the morning and at noon. Sartre took 20 a day, beginning with his morning coffee, and slowly chewed one pill after another as he worked. For each tablet, he could produce a page or two of his second major philosophical work, The Critique of Dialectical Reason."